Spring Air Industrial Acoustics provides a comprehensive portfolio of leading noise control and sound vibration solutions. Environmental protection, safety, legal requirements and personal quality of life are driving the demand for innovative noise control packages. With over 30+ years of experience, Spring Air Industrial Acoustics understands how to ensure these demands are met with cost effective quality solutions. We deal in a wide range of products and services including custom enclosures, acoustic panelling, silencers and many other industrial noise solutions (see our Products & Services page) as well as offering extensive industry expertise. As business and industry develop, we understand the importance of continued pioneering in our field. Our commitment to our customers is if you have a noise problem we will find a solution that meets your needs. Spring Air Acoustics is established May 4, 1984 as mainly a Vibration Isolation and HVAC Silencer business for the commercial construction industry. Spring Air Acoustics supplied and installed it’s first industrial noise control project on a gas compressor near Penhold, AB. Many years of building relationships within the industry, SAA became known as a dependable Noise and Vibration Control business throughout Alberta in the commercial building construction and industrial oil & gas sector. Spring Air Industrial Acoustics is established to separate the Vibration Control business from the industrial applications. Spring Air Ltd. is established to manufacture industrial air handling units, acoustic barrier wall panels, industrial inlet, outlet and exhaust silencers for gas compressors and building ventilation compressor buildings, power plans and pipeline stations. 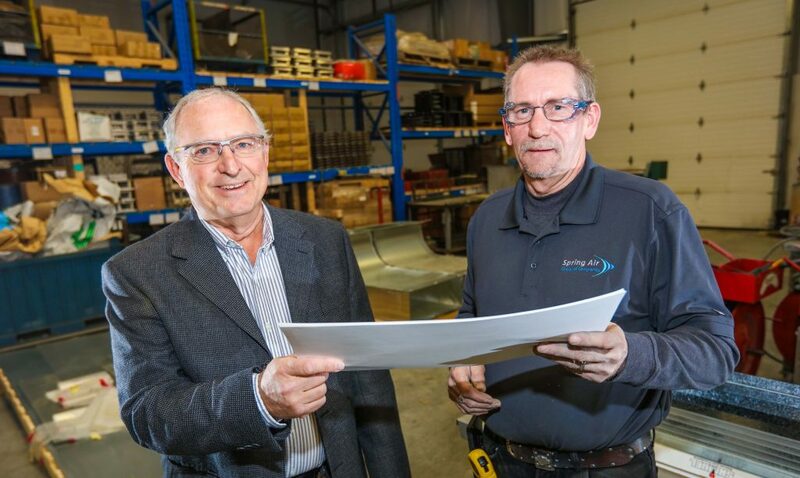 Spring Air Group of Companies builds from the ground up a new 14,960 sq.ft manufacturing facility and office space in Airdrie, AB.